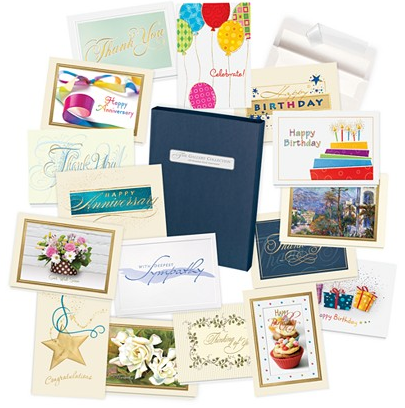 You can never go wrong having an assortment of greeting cards on hand. The Gallery Collection assortment box is ideal for individuals that prefer to be organized and on time in their card giving. If you are an advent card giver like myself, you should never be without a collection of cards. This will save you time, money and the agony of looking at all your card options. It’s not just me, but I like to give cards that are personalized. I like them to be a good quality paper and print instead of those crappy 99 cents cards. That is a pet peeve of mine. Ask my Aunt Queenie, she will never do that again! I like the all occasion card assortment box because they have a little bit of everything in them just like a box of chocolate; but in this case you know exactly what you are getting. This will ensure that you will never miss an opportunity to share a special occasion, a life milestone, a thinking of you, etc., kind of moment. So remember to give a card to that neighbor that gave you those sweet, tasty tomatoes out of their garden with a “Thank You” card. I guarantee you will get a pumpkin pie the next time! I love having my assortment box of cards! I always get such great compliments on your cards. I purchased a few boxes of assortment cards for myself and to give as gifts to some family members last Christmas. The cards are really beautiful and come in a nice box so they make for a great present – especially for people who are hard to shop for since everyone uses cards! My aunt and mother have both told me how useful the gift has been when they are in need of a card and don’t have time to run to the store – plus these are much nicer! It’s kind of a “just in case” box I like to leave at the office. No more asking my wife to pick up a card the next time she’s shopping. And no more missing the date when someone at work has a birthday. It’s convenient for me, for sure. I love having the all occasion assortment box on hand. There is always a Birthday or Anniversary right around the corner, not to mention someone who is not feeling well. It’s so great I don’t have to run to the store at the last minute to pick out cards; this is also a terrific money saver. Your All Occasion Assortment Box is a life saver. Can’t tell you how many times I forgot to shop for a birthday or anniversary card. So glad you have such a variety of cards, it makes my life much easier. Having a box of cards like this available is a very convenient thing. It’s true you never know when an occasion will pop up where you need a card quickly. Or you look at the calendar and realize your friend’s birthday is only 2 days away! No worries about dashing to the store – just look in this handy box and grab a nice card! I work in a very busy law office. I can’t count how many times I’ve had to run out on my lunch break to pick up a card for one of the partners. I find the idea of having a box of assortment cards handy in the office very handy and helpful. No more wasting my down time! My friends and family love the fact that I always have an assortment of cards on hand. Every time they have an occasion to give a card, they come over to pick one out from my collection. A friend gave me one of these and I just love it. Very convenient and the cards are beautiful. I’ve enjoyed sending these quality cards and intend to order myself another box when I start running low. Great product! In our office, sending cards seems to fall to me so I ordered both All Occasion Assortment Boxes and I feel ready for anything that comes my way. The designs are beautiful, the quality is excellent and the boxes keep them neat and organized. I keep one of these assortment boxes at work and another at home. They really are so useful! I can’t tell you how many times they’ve saved me when I’ve forgotten to pick up a card – and all of the cards in the box are beautiful! I checked the dictionary for advent as Tia said she is an advent card giver. Advent – arrival, especially of something momentous. So Tia gives cards before a momentous event, like a birthday or an anniversary. I guess we all are that type of card giver, except for those of us who have need of the belated birthday cards because we didn’t send one before the event!